Monkeys in the main tourist square (Jamaa El Fna Square) bound by tight metal collars around their necks and chain leashes are forced to perform tricks for tourists. "One man dragged a monkey along on his back, ignoring his cries of pain..."
"All the monkeys I saw were holding the chains away from their throats as if they were too tight..."
"One evening one of the men punched a monkey in the face because it was misbehaving, then he opened the box and threw the monkey inside..."
"When a monkey fell from being yanked he was kicked to make it get up..."
"The men make the monkeys fight for photo opportunities..."
YouTube footage from 2015 shows this torturous treatment of the monkey. These monkeys are kidnapped from their families in the wild for the purposes of entertaining tourists. They are now dependent upon their human handlers and perform out of terrified. 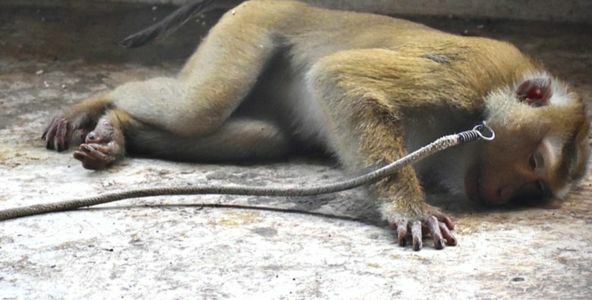 Please read this article: http://themoroccantimes.com/2016/05/19819/horrifying-abuse-of-monkeys-in-marrakech for more information. Please join me in urging the government of Morocco to stop the abusive treatment and send the animals to a sanctuary. These beautiful and intelligent animals are suffering and deserve better – they desperately need you to speak up for them. Please sign and share this petition right away! I have contacted both the Moroccan government and Prime Minister back in April but have not received any response. I will continue to contact different organisations to highlight this barbaric treatment of monkeys and keep you updated.